Aerodynamics for the real world! We knew our wheels are fast, but when we tested our DARC profile's performance against a range of wheels from leading competitors, the outcome exceeded our expectations. The Netherlands, home of FFWD WHEELS, is world-renowned for its flat landscape, its rain, and its wind. These conditions provide the most rigorous testing environment for carbon wheels. The strength, durability, and performance of FFWD’s range are achieved through a combination of factors, starting with aerodynamics and rim design. FFWD’s engineers understand the real-world wind conditions that cyclists experience and how these conditions directly affect the aerodynamics and performance of wheels. 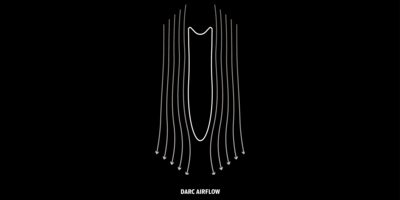 Through intensive research, the testing of numerous rim shapes, wind-tunnel testing, and in-depth analysis of real-world wind conditions, FFWD developed its proprietary DARC™ ‘Double Arc’ aerodynamic technology. The initial design was based on the theory that the effective winds a rider experiences tend to fall within a lower yaw angle* range than the 10-20° cited and adopted by numerous competitors. The revolutionary DARC™ profile is designed to achieve optimal aerodynamic performance by reducing drag around the wheel in both frontal and cross wind conditions by creating a negative-pressure section that compresses and speeds airflow over the rim, thus reducing drag while also increasing stability. FFWD’s DARC™ technology is found in the F4-series, F6-series, and F9-series wheels. *The yaw angle is the calculated real wind angle, when the speed of the actual wind (effective wind) and the wind speed produced by the rider (apparent wind) are taken into consideration. A typical cyclist experiences average yaw angles of 0-10° for more than 70% of the time he spends on the road, regardless of where he is riding. Under these real-world conditions, FFWD’s F6R-series and F9R-series wheels with DARC™ profiles offer the best aerodynamic advantage over the competition. 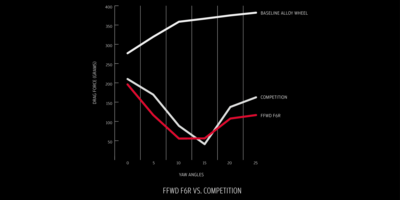 FFWD tested the DARC™ profile’s performance against a range of wheels from leading competitors. The results (see graph) show that the F6R wheels offer the best performance under real-world wind conditions, i.e. when yaw angles are between 0 and 10°. This results in a gain of one minute and 35 seconds over an IronMan distance! More recent studies in bicycle-wheel aerodynamics have validated the premise behind FFWD’s DARC™ technology, most notably the 2015 Catalyst Cycling LLC’s white paper “The Mathematical Model of Yaw Angle Distributions For Bicycle Wheels” (Zach McCormick, Nick McCormick, Justin Clarck). Even at the IronMan™ World Championships in Kona HI, a rider spends 72,1% of the bike leg experiencing yaw angles below 10°, according to Catalyst. Many wheel manufacturers claim that 50% to 80% of a ride will be spent with yaw angles between 10° and 20° and have based their current wide rim profiles on this inaccurate premise. In fact, this is not possible, unless it is theoretically assumed that there is a near constant crosswind throughout an entire ride. As a rule of thumb, approximately 50 grams of drag at 30mph is worth 5 watts. "Win one minute and 35 seconds over an IronMan distance!"